"Please! Help me delete the BUGS!" cries a troubled BITROBO! Get everybody's help to solve the puzzles and save BITROBO! This app is a game designed to teach you logical operations as you play! In the computer world, instead of the usual four arithmetic operations, logical operations are very important. However, logical operations are rather unique compared to the four arithmetic operations. With this app, you will learn about those unique logical operations as you play a game. In this game, you will be using panels containing the four logical operations in order to delete the "BUG". Get everybody's help to beat up all the "BUGS" and save the troubled BITROBO. The game also includes a tutorial that will help you to easily understand how logical operations work. - BITROBO, the mascot character, will kindly explain you how logical operations work. - You will learn about the four logical operations that appear in this game in a sequential order. - BITROBO will also explain the mechanics and rules of the game in an easy to understand manner. - Move around the panels positioned on-screen to defeat the BUGS! - Combine the panels to turn the switches held by the BUGS into  or  in order to defeat them. - Defeat all BUGS to clear the level. - Finish the puzzles quickly to get more stars. - Use the panels wisely and defeat the BUGS coming from the other side. - If the BUGS reach BITROBO, it's GAME OVER. 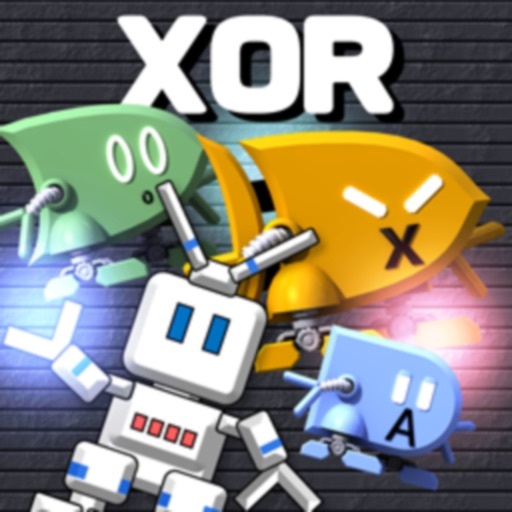 - Defeat the BUGS in the same way as Puzzle Mode. - Defeat lots of BUGS and get a higher score. In-app purchases will allow you to play Puzzle Mode in Advanced level and above without having to watch a video.